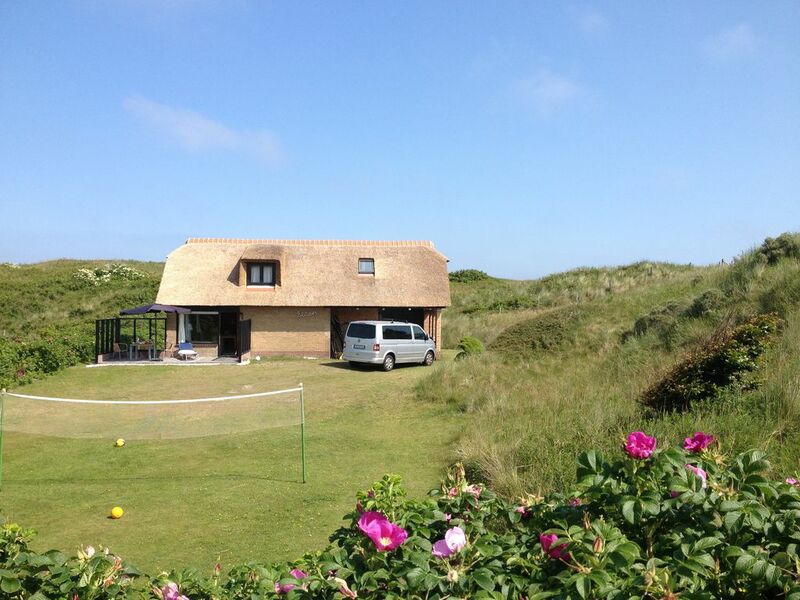 On one of the most beautiful plots of Ameland, with over 2000 square meters and own dune, is our so far in family possession carefully maintained holiday house "Beauty". In this beautiful dune area between Nes and Buren are beautiful thatched houses on large plots, which give the bay a very special charm. Directly in front of the house adjoining the south terrace is a large wide lawn, where you can play wonderful volleyball and other sports. For necessary equipment is of course available. The sea facing garden area behind the house invites you to barbecue, unobserved sunbathing and relaxing. There is also a private sunrise, which leads through the dune landscape directly to the sea. Away from the beach steps Buren or Nes offers this beach pleasure away from the crowds. Our house itself is very cozy. In the open ground floor you will find a modern kitchen with a small counter and large window area. Here, cooking becomes a natural experience, because a window area lets your eyes wander. The beautiful living and dining area is flooded with light and offers fantastic views of the dunes. It is designed with a comfortable carpet. Here you can puzzle and play. The adjoining TV room, is our so-called "lowered room", which is lower than the dining area and so offers optical retreats. Upstairs you will find our 3 cozy bedrooms, with a separate sink. When the window is open you can hear the sound of the sea and see the stars twinkling through the skylights. Wir hatten tolle zwei Wochen und haben jeden Tag genossen. The island offers excellent opportunities for cyclists, mountain bikers and joggers no matter what level of ambition. In the Kiteschool "KiteAmeland" you can learn to kite in the best conditions. Windsurfers both on investors in Nes, as well as in Nes on the beach at their expense.